With Spring Training upon us, and Milton reporting with happiness and ready-for-fresh-startiness in the air, let's go ahead and celebrate his colorful background with this handy little collection of images. "I think that we're going to be okay. 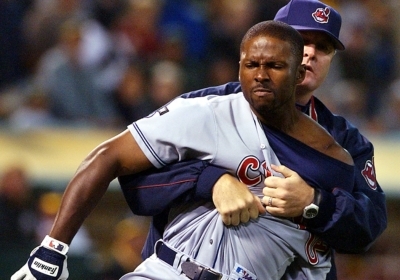 I like Marlon Byrd. I think Carlos Silva, the new pitcher, may come through for us in a surprising way. So I am optimistic. I think the Cubs can win the division if they have a couple of good years from Soto, Soriano, Silva and some of these guys." He doesn't blame Fukodome for his performance woes. Yeah, these would be surprising. But a change of scenery can do wonders. As we axiously await the start of spring training we have some time on our hands. File this under the "Northwest Sports" department. Half of The Log was down in Portland yesterday and had the opportunity to catch a Trailblazers game. They just happened to be playing The Zombie Sonics last night. The game itself was simply awful. Here's a recap courtesy of the Portland Tribune if anyone cares. Portland's best players are injured, nobody could score, Durant could get to the hoop anytime he wanted, etc. 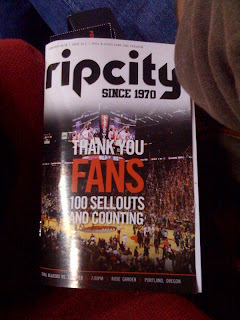 The Blazers were touting their "100th Consecutive Sellout," with pre-printed materials and other fanfare. The only problem is there were plenty of tickets available leading up to tipoff. Tickets availalble for purchase directly from the Blazers, huge blocks of tickets on StubHub, etc. Hard to imagine this game was a sellout. But I guess when you print out programs that say 100th Consecutive Sellout, you have to go with it. 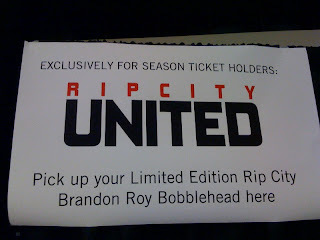 It was also Brandon Roy bobblehead night. So we were moderately excited to get a tiny statue of one of Seattle's best hoops products. Not so fast! You have to be a season ticket holder to get the bobblehead. The admission you paid to this "sold out" game is not good enough. No Roy for you!! Kind of sad to see Blazer workers packing up all of the extra bobbleheads. MLB, and specifically the Mariners, put a great product out there for fans. This isn't to say the Blazers aren't a great asset for a one-horse-town like Portland, but the NBA's product seems watered down, relying on gimmicks and loud promotions to distract from the mediocre product that is on the court most nights. Makes me even more excited for pitchers and catchers to report to spring training! What was Jason Marquis thinking when he signed as a free agent with the Nats? Seriously. Is he just a really nice guy who wants to be "part of something special" or "help the kids learn the game" or "loves losing"? Well, it turns out he just wanted to feel short. Represented by 6 Nations (7 if they sign Wang), therefore they must be considered the Internationals, in my estimation. Yusmeiro Petit 6' 1" 253!!! 1. What is the better rotation? 2. Which team wins a fist fight? My totally uneducated speculation says that, yes, the Nats have a stronger rotation than Tacoma. Zimmerman is actually a good pitcher and JD Martin has a pretty nice minor league track record. A fist fight though? How do you bet against Fister's reach advantage and Petit's ability to eat at least one of the opposing pitchers? 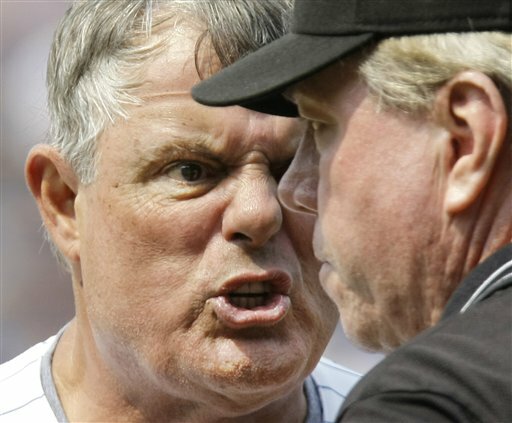 And you know that Wang would run into the clubhouse, so there's that too. Oh, wait - so would Garrett Olson. Frankly, I'm not sure who this reflects more poorly on - Freddy or White Sox fans. I'm leaning with the latter. So Jon Morosi tweets that Jarrod Washburn will retire if he doesn't get a reasonable offer from the two clubs he wants to play for, the Twins or the M's. He would demonstrate "veteran savvy" while shopping at Best Buy. He'd be "gritty" on the lake fishing for trout. His "left-handedness" would come in handy with the remote in one and a PBR in the other. Every 5th day, he'd give his all when he rides the John Deere around the Washburn turf. He'd show his "moxie" as he told stories of hating Kenji Johjima to his kids by the campfire. Um... flipper...sarcasm...flipper...snark. I don't know. Homeless people all over Detroit are seen in these. So I wrote about Bedard last week in a semi-coherent post about the advantages of being so close to him during his rehab. I made a pitch for the M's to go ahead and sign him now, with guaranteed money, if they were comfortable with where his rehab was going and had a reasonable expectation that he could contribute this season. Now Jim Street is saying that such a thing has happened. Maybe he's right, maybe he's loony. Whatever. To speculate on whether this is a good thing or a bad thing seems kind of silly until we know what the incentives are. But - 1.5 million guaranteed with incentives up to, say $6 million bucks based on performance and innings - to me, that's a relative bargain. 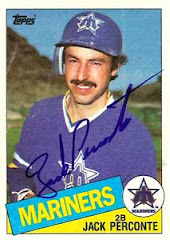 Bedard pitched hurt through two seasons in Seattle and he still had filthy stuff. I'm always surprised how quickly Mariner fans forget that the guy had a 2.82 ERA (3.55 FIP) and a 9.76 K/9 rate last year over 83 innings. 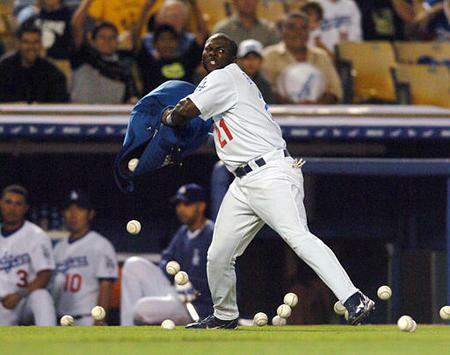 In just 83 innings, he was 1.9 WAR. Bedard is a very, very good pitcher. A disappointment overall, yes. Frustrating as hell, yes. No personality whatsoever, yes. But if, IF, that shoulder can hold up (and everything else that falls apart on him) for half a season, we want him on our team. He would ostensibly be replacing Jason Vargas in the rotation, barring some completely unforeseen breakout by Vargas or a catastrophe by RRS or Snell (or injuries). Where Bedard was 1.9 WAR in half a season, Jason Vargas is 0.7 WAR for his whole career. The upgrade would be significant. I'm also not at all convinced that Z is finished shopping for a starting pitcher, either - but I guess that's another post. I'll tell you what - in June, when the M's are hanging around in the AL West, a hand full of games above .500 - you're going to be very excited that you have an Erik Bedard in your back pocket. I'm just saying it to get used to the idea. I don't like it, but if I were a bettin man, I'd say it's about 75% that Washburn comes back to the M's. The way I see it, if they go with an 11 man staff, which this Bradley/Garko/Byrnes/Griffey/Saunders/Kotchman clusterf#@# almost necessitates, they're going to need an innings eater. I wouldn't call Snell and Vargas innings eaters. You just can't have a bullpen an arm short and have guys going out there and giving you a Morrow-like 4 IP, 103 pitchcount. Plus, they're not going to burn up a farmhand's arm just to save the bullpen. But they might leave Washburn out there an extra inning or two even if he doesn't have his best stuff just to keep the short guys rested. 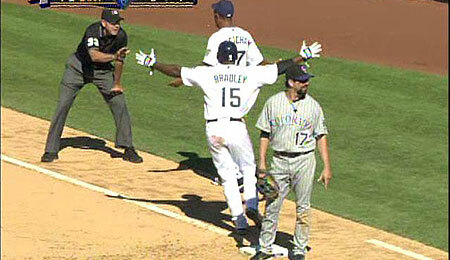 And honestly, Washburn is probably the type of guy that wouldn't mind doing it at this point in his career. The only alternative is if Johnson and Moore come out looking ready to rake in the Spring and the team figures Garko is an emergency backstop, so they part ways with Josh Bard. Then maybe we can go with a 12 man staff and then perhaps things change relative to the need for stability in the rotation because they can carry an extra mop-up stiff like French or Olson around. But that seems like an unlikely scenario. Look, my strong preference is still Smoltz, but he's going to be more expensive (and it looks like he might not even sign until July). So here's hoping Washburn can rediscover that magic (luck, cough cough, luck) he had as a Mariner for the first half of last season one more time. We might as well get used to his "gritty-ness".